Boy did the loneliness really begin to settle in today. I think it was the combination of not really talking to anyone for 24 hours combined with the empty Wyoming scenery that sort of destabilized me a bit. On this isolating day I was reminded of one of the more challenging aspects of solo touring: solitude. I awoke with the Sun at the Big South campsite. My day got off to a good start since I was able to quickly wrap up the tedious process of rigging my bicycle. I was on the road before 8 a.m. The first eight miles of my ride had the steepest grade of any of the miles I had put on going up the Poudre Canyon. It was certainly exhausting to roll out of bed and be met by 5 to 6% grade. I would much prefer to be met by a bagel with cream cheese. Six miles in I realized that I was low on water. Not knowing how much further to the top and concerned that the river may diverge, I pulled over to collect some water. This was actually my first time purifying water during this whole trip. I used my USA bandana to gather water from the stream and filter out any large debris before transferring it to my bottle. Once full, I used germicidal tablets to clean the water. It was sort of satisfying to be gathering water directly from nature. Plus, on some level it made me feel good knowing that my USA bandana protected me by filtering out some of the junk. Yes I'm getting all patriotic on you. America. God bless. From the river it was only about 2 more miles to Cameron Pass. It sure was serene up there, especially under the morning light. After taking the mandatory summit sign pics it was again time to reap what I had sown. Here came the downhill. The descent started with a scenic eight mile downhill that was unforgettable. I marveled at the sharp cliffs that towered above me. The photographer in me begged me to stop for pics but the cyclist within me refused to slow down. 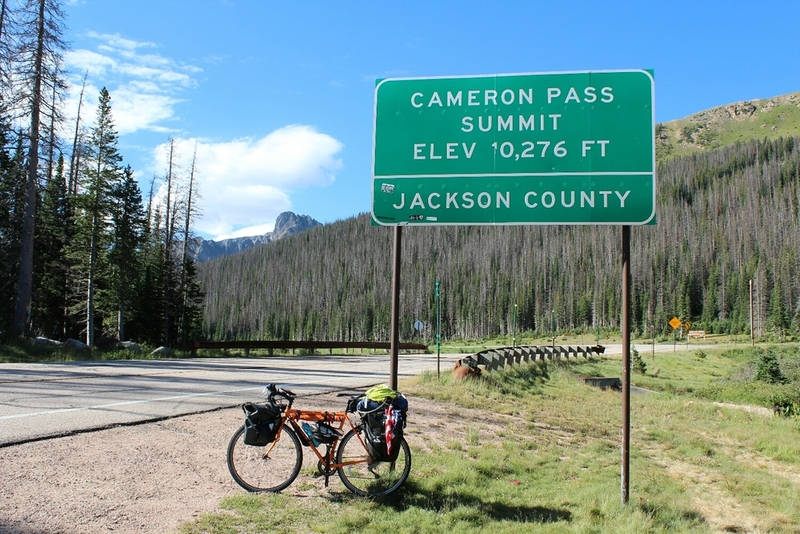 After a 90 mile climb to Cameron Pass from Fort Collins it was the cyclists turn to enjoy himself. I bombed this downhill. The next 20 to 30 miles were a combination of mild downhills and flats sprinkled with the occasional campsite or cattle ranch. I pushed forward, eager to rejoin with the TransAm. Close to Walden I was forced to stop at a construction site. I asked one of the young construction workers how far it was to Walden. Given that he was working on the roads, I figured he had a clue about how far it would be to the nearby town. His response puzzled me. "Walden's probably like 20, maybe 15, maybe 10, or like seven, maybe five miles from here." What you need to understand about me is that I'm a data analyst and am thus very precise when it comes to numbers. A range of 5 to 20 miles was sort of ridiculous, so I responded, "You're kidding right?" Man, that came off really rude. I'm not sure that he picked up on my rudeness, thank goodness, so he walkie-talkied his supervisor to ask. The correct answer was 4 miles. I thanked the fellow, then rode 20, I mean 15, err 10, I think seven, oh actually 4 miles to Walden, where I had an excellent lunch at the town's bowling alley. From Walden I road about twenty miles North on empty roads to arrive at the Wyoming border. As I approached I noticed signs warning me of "Smoke on Roadway." This was a bit disconcerting. Coming from the city, I had no idea how to interpret this warning. Forest fires were way out of my comfort zone. Did this mean that there was an emergency situation? Did I need to turn around? I was unsure of how to react. Luckily, a U.S. Forest Service ranger was parked on the side of the road, monitoring the fire. I figured it would be a good idea to gather some intelligence from him. 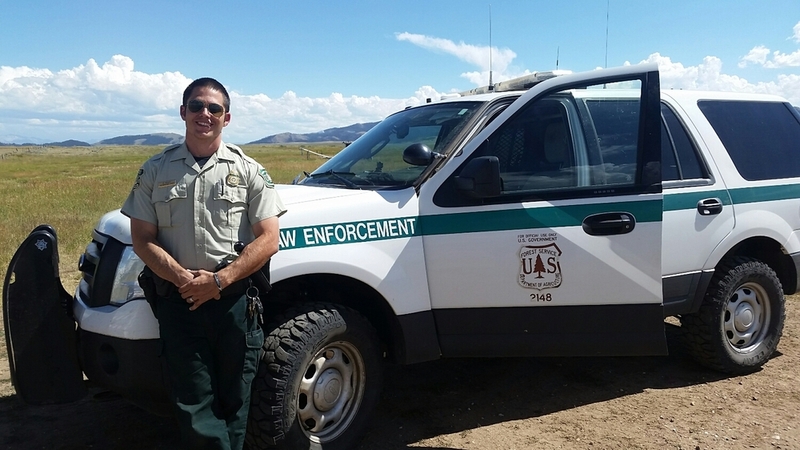 This Ranger, Mark, was somewhat new to Colorado, coming from Arizona and having worked in Utah before. He explained that this fire, now and its eighth week, had mostly been contained. What was burning now was just beetle kill. I was comforted knowing that at least someone seemed to have a clue about what was going on. I enjoyed talking to this guy, especially considering the fact that I hadn't really conversed with anyone in about 36 hours. During our talk I was pretty straight up, telling him that I had completed over 3,000 miles and was growing exhausted. After four months on the road, I was really coming to miss the simple comforts of home. I told him that the 1000 plus miles I had to ride to arrive at my destination, Portland, felt daunting. He gave me the best advice I have gotten in a long time. "You'll just have to take the miles one at a time," he said. My talk with Mark was uplifting, helping raise my spirits on this lonely, ominous ride into Wyoming. So I arrived at the Wyoming border where I was greeted by a raging forest fire. What a thoughtful reception for an exhausted, solo cyclist. Reassured by Mark the ranger that the fire posed no immediate threat, I was able to take some interesting pictures of the smoke plumes arising from the mountainside. The character of Wyoming was revealed soon after my entry into the state. What was Wyoming's character? Nothing. I don't mean nothing as if to suggest that the state has no character. I mean nothing in the sense of nothingness. No town, no homes, no signs, no people; Wyoming felt uninhabited. Every 10 minutes or so I would be passed by a vehicle, but besides that it was just me and the aggressive Wyoming wind. I pushed myself really hard, perhaps too hard, on this abysmal day. My mileage total for the ride reached 93. That was the second longest ride I had ever done in my life. This was not unintentional. On some level I felt haste to get to Portland. I figured that the more I rode, the sooner I would be alleviated of my solitude. I pushed myself hard, motivated by my seemingly excessive need for company. My final eight miles were disheartening. The winds blew Westward, leading me directly into the steady current. The wind was so bad that I actually coasted to a stop on a downhill. This really broke me down. My feelings of solitude turned into feelings of solitary confinement. Not only was I lonely, but I was lonely and trapped. 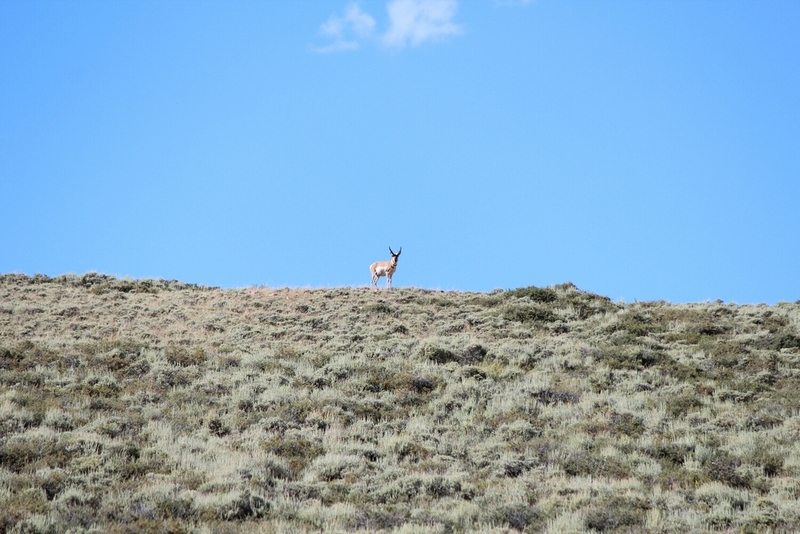 There was no escaping Wyoming's desolate, volatile environment. As my back and knees weakened, I was forced to succumb to the elements. There would be no shortcuts in Wyoming. 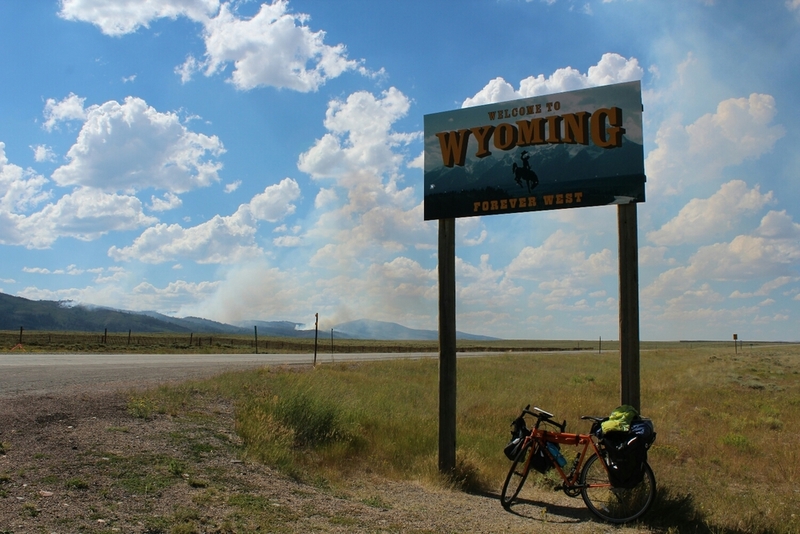 The only way I would get through Wyoming was as Mark had instructed me: one mile at a time. I arrived in Riverside feeling defeated, overpowered by the Wyoming wind. A painful realization dawned on me as I set up camp; I would have to accept, and to a certain extent become, part of the void that was Wyoming.